By Bruce M. Hyman, Ph.D.
Anxiety Disorders was published in 2006 by Lerner Publishing Group Wed like to tell you more about this valuable resource. 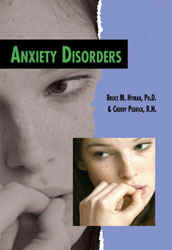 Below is an overview of Anxiety Disorders. Fear is a normal, healthy part of the human experience. It is an appropriate response to threats, challenges, and potential loss. Every day, fear encourages you to study harder for tests, reminds you to get college applications in on time, and makes you take reasonable safety precautions. When fear is excessive, out of proportion to the threats, and causes excessive worry about future events that are not likely to happen, the result is anxiety. When anxiety persists and interferes with daily life, an anxiety disorder may be diagnosed. The young people described in this book have struggled with anxiety. Between 20 and 23 million Americans have some type of anxiety disorder. Some of the most common types include general anxiety disorder, panic disorder, social phobia, specific phobias such as fear of heights or spiders, obsessive-compulsive disorder, post-traumatic stress disorder, and acute stress disorder. Through real-life case studies and information from experts, this book provides the tools young people need to understand various anxiety disorders affecting themselves, their friends and family, and their world. Readers will learn about the latest treatment options, including the importance of stress management for dealing with anxiety. This is a great resource for school projects, as well as for teens and adults who have an anxiety disorder or know someone with an anxiety disorder. Even adults will appreciate this easy to understand introduction to anxiety.